BERLIN: Volkswagen AG is speeding up a facelift of the $88,000 Phaeton sedan in time to unveil the model at the Beijing auto show and target China's millionaires, said two people familiar with the matter. VW, which withdrew the Phaeton from the United States in 2006 after a sales flop, is designing new front and rear sections, an interior upgrade and a wider selection of engines for the car, said the people, who declined to be identified because the revisions aren't public. The model will be presented on April 23, before the start of the Beijing event, instead of in the second half as previously planned, they said. The Phaeton, named after the son of the Greek god Helios, went on sale in 2002, with development costs exceeding 1 billion euros ($1.3 billion). The model was part of then-Chief Executive Officer Ferdinand Piech's effort to take the VW brand into the luxury market against Bayerische Motoren Werke AG and Daimler AG's Mercedes-Benz. The car never met an annual target of 20,000 deliveries, and sales last year fell 27 percent. "The VW brand simply doesn't appeal to rich buyers," said Willi Diez, head of the Institute for Automobile Industry in Nuertingen, Germany. "Technologically speaking, the Phaeton is a great car, but it doesn't undercut rivals' prices enough to attract sophisticated shoppers." Peter Thul, a spokesman for the VW brand at the company's headquarters in Wolfsburg, Germany, declined to comment on the Phaeton's revamp. The Phaeton's least expensive version, costing 65,800 euros, is a six-cylinder car with a 240-horsepower diesel engine, according to Volkswagen's website. The price rises to 125,600 euros for the 12-cylinder model with a 450-horsepower gasoline engine and longer-wheelbase option. Mercedes-Benz's S-Class starts at 73,720 euros, BMW's 7- Series at 73,300 euros and VW's Audi luxury brand's A8 at 89,300 euros, according to the manufacturers' websites. "The outlook for the Phaeton is excellent and, since we're freshening it up a lot, we may have our best year on record," said Frank Loeschmann, director of VW's plant in Dresden, Germany, where the model is assembled. A full revision of the car will take several more years, he said. Volkswagen's group sales in China, which surpassed the US as the world's largest auto market last year, surged 37 percent in 2009 to 1.4 million cars, sport-utility vehicles and vans. VW plans to invest 4 billion euros on new models and plants in China by 2011 to achieve 2 million deliveries in the world's third-largest economy by 2018, part of an effort to overtake Toyota Motor Corp as the largest carmaker globally. Chinese deliveries of the Phaeton rose 40 percent to a record 1,400 cars. Volkswagen aims to increase that figure to at least 2,000 vehicles this year, a 43 percent gain, to make China the model's biggest market, the people said. Volkswagen sold 4,500 Phaetons worldwide last year. About 825,000 Chinese citizens had a net worth of 10 million yuan ($1.5 million) or more last year, and many weren't affected by the financial crisis, the Hurun Report, which compiles an annual rich list, said in April 2009. The country's millionaires are on average 39 years old, the report showed. Their combined wealth ranked fourth worldwide in 2008, overtaking the assets of their UK counterparts, according to a Merrill Lynch study. "Success in China is absolutely crucial for Volkswagen's expansion goals," said Stefan Bratzel, director of the Center of Automotive at the University of Applied Sciences in Bergisch Gladbach, Germany. 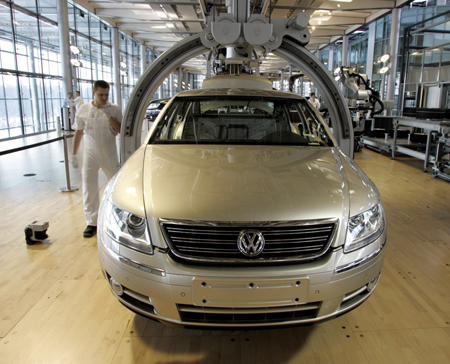 "Selecting China as the venue for the launch of the new Phaeton proves VW's commitment to this vast market." Four years after the Phaeton's US exit, there's still no decision about a reintroduction of the model there, according to Jill Bratina, a VW spokeswoman. Luan Shengjie, a 23-year-old photographer, penetrated deep into Yunnan province and recorded not only the faces but also the wishes of the old soldiers. Actor Gerard Butler and Jennifer Aniston promote the movie The Bounty Hunter in Madrid March 30, 2010. A Time magazine article describes Ordos, the booming China property market in stark contrast with the actual empty city.